'Convert Doc' has been optimized for quick conversions. It also allows for the saving and restoring of 'conversion jobs'. A 'conversion job' is one or more conversion tasks. From simple to complex it can quickly recall past work. Command line capability is fundamental to ALL of our software tools. Demo batch files are installed ready for testing and modification. We are always here to help you implement our software. Moving or deleting files while converting PDF to Word is no problem at all. Easy, unattended conversion of whole folders...you bet. Quickly convert files into the formats you need. Enjoy fast conversion of PDF to Word (DOC & DOCX), RTF, HTML, TXT and other files. Skip files already processed. Move or delete files after processing. Convert into file formats using our own fast conversion or Microsoft Word’s conversion algorithm. Automate batch document conversions from the command line or with the COM/ActiveX interface. Schedule unattended conversion jobs at regular intervals (time or calendar based). Save and restore complex conversion configurations. Process files with special requirements such as concatenation (appending), removing extra lines, and adding search and replace strings. Adapt our document conversion program for most languages. Stop and resume batches at a later time. Convert PDF files to/from DOC/DOCX/TXT/HTML without needing anything else to be installed. Very fast PDF to TXT conversion method included. Optimize for speed or memory usage. Convert DOC files to PDF/DOCX/TXT/HTML/RTF without needing anything else to be installed. Special Promotion: Buy 'Convert Doc' and get 'Convert XLS','Convert Image' and 'Convert PowerPoint' free! Need a Tool for Converting PDF to Word? This program does not require anything else to be installed for it to work and it is exceptionally fast and accurate. Below we discuss how to use the programs user interface and command line interface to specifically convert PDF to Word. Both methods allow you to automate your conversion needs easily. The user interface has a built in scheduler, and 'Convert Doc's command line (or COM/ActiveX interface) can be used with batch files or your programming language. NOTE: PDF to DOC conversion is only one of many things this tool can do. To learn more about 'Convert Doc's complete functionality see the on-line documentation. Of course please do download it and try it for free. Select the 'Convert From PDF to ???' conversion method (the 'MS Word' method may also work) and select your input file. If you are converting a whole folder of PDF files, select the folder and specify all the PDF files within it. For example to convert all the files in the folder "c:\My PDF Files\" set the Input path to "c:\My PDF Files\*.PDF". Note the use of the asterisk "*" character which is required when specifying a whole folder. Specify the output file path and name. If you are doing a whole folder specify the output path with the asterisk " *" in the name. For example "c:\My Output Folder\*.DOC" is proper. Specify the file type to convert to by choosing the " Convert To File Format" which in this case is DOC (or DOCX). Click the CONVERT button on the tool bar to start converting. Select the 'Convert Doc' conversion method and select your input file. If you are converting a whole folder of DOC files, select the folder and specify all the DOC files within it. For example to convert all the files in the folder "c:\My Files\" set the Input path to "c:\My Files\ *.DOC". Note the use of the asterisk "*" character which is required when specifying a whole folder. Next select the Input File Format which in this case is DOC or DOCX. Specify the output file path and name. If you are doing a whole folder specify the output path with the asterisk " *" in the name. For example "c:\My Output Folder\ *.PDF" is correct. If not already done, choose the file type to convert to which in this case is PDF. Click the CONVERT button (or F5) on the tool bar to start converting. 'Convert Doc' can be especially useful if you require complicated conversion jobs done on a regular basis. By saving and recalling a conversion job file, 'Convert Doc' quickly remembers all the file conversion tasks and their details. It is the best file conversion tool you've never used... till today! Download and try it out for free. Although we'll discuss the use of the command line here, it's only to give you a taste. For the full, accurate, and up to date information see the 'Convert Doc' command line documentation. There you will also find a full list of examples and how to troubleshoot. NOTE: After installation, you can find several simple batch (*.bat) files for quick and easy usage by going to Start\All Programs\Convert Doc\Example Batch Files. These will work without modification provided the installation was in the default folder. Email us at if you have any questions or need additional examples. We will get you up and running fast! Command line switches are case sensitive. Always using double quotes around paths will keep you out of trouble. A 'Conversion Job' is easily built using the 'Convert Doc' graphical user interface. All the details of the job are saved in a single conversion job file (e.g. 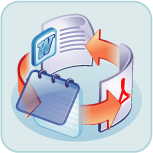 c:\myjobs\PDF-To-Word-Multi-File-Conversion.SII). Specifying a conversion job with the command line is done by using the /J switch. You can have hundreds or thousands of tasks specified in the conversion job, all of which will get executed in one fell swoop. Items above enclosed in square brackets '[ ]' are optional, all other 'switches' are required. Therefore /J should always be specified on the command line when using this approach. Items enclosed in square brackets "[ ]" are optional, all other 'switches' are required. Therefore /S, /T, /C# should always be specified on the command line when using this approach. NOTE: If you have trouble running these examples, see Using the Command Line and Helpful Hints For Creating a Command Line. The /S and /T switches above specify Source (input) and Target (output) path respectively and are both required when converting a single file. Use double quotes around the path, especially if there are space characters within the path. The /M3 switch tells Convert Doc to use the 'PDF Conversion' method (it is one of the three possible conversion methods). /C3 specifies the output file type, which in this case is a DOC/RTF file. The /V (for Verbose) switch is used to give instant feedback by having the program report the status of the conversion with a message box. You can remove this once you have perfected your command line specification. You can also (or instead of /V) create a Log file that will contain the results of the conversion by using the /L switch. Note: Use the Verbose (/V) switch initially to see what the status of your conversion is and to help you perfect your command line. In verbose mode, 'Convert Doc' displays messages to indicate what went wrong or right with your command line. The /G switch can be used to tell Convert Doc to place the converted file in the same folder as it found the input. To extend the previous example (immediately above) to convert all subfolders within D:\ToDo\,add the /R switch. "Great customer service, prompt attention to our requirements and lightening speed development has been my experience with the staff at Softinterface Inc. "..."For several months now, their product has been working in mission critical environment flawlessly. With a few enhancement requests that were completed and delivered the same day they were asked for"
"Absolutely awesome. The product worked beyond what we expected. I am going to recommend the full version to our web team. " formally EDS - BPO US Request Management. Years of 'Convert Doc' development. Time tested for your demanding requirements. Non-profit organizations assisted. Are you a member of one? Let us know, we would like to help. Customers in 110 countries. 1 in 3 Fortune 500 companies use our software. 'Convert Doc' is compatible with Office 97 through Office 2016. We've been at it a long time! Hands free document conversion is our specialty! We'll hold your hand if you need it too! We love helping our customers automate their work load.